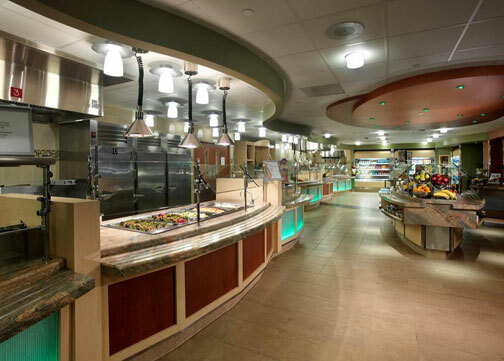 The Annenberg Pavilion features a new dining facility that serves the entire medical center. Sophisticated, easy-to-maintain surfaces feature granite tray slides, back-lit colored acrylic facades, porcelain tile floor, cherry and maple plastic laminate casework. Lighting is focused where needed and does not flood the room with an institutionally high level of light.